Like most people I am obsessed with unicorns. I love them, I have pjs with unicorns on, my screen saver is a unicron, I have a unicorn jewellery plate, slippers, t-shirts, bags, teddies (yes I am 29 years old) you name it I probably have it. So when I saw a make up brush in the shape of a unicorn horn I HAD to have it. The company From Maisie was started by a lovely lady called Emma and her husband James, it truly is a family affair since the brand is named after their daughter, which I think is just adorable. 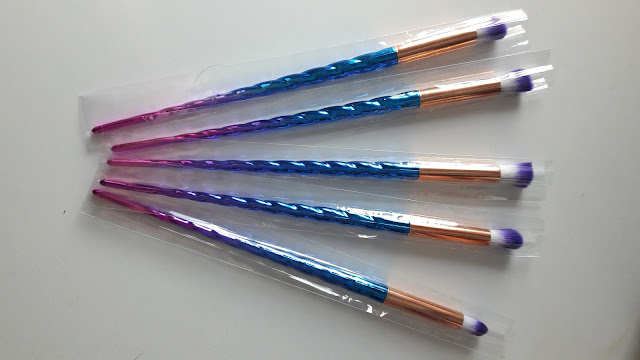 Not only do they sell unicorn shaped make up brushes but they also sell mermaid tail shaped brushed too. 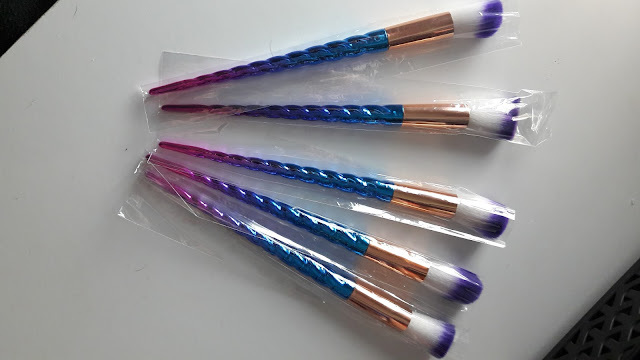 So all you mermaid lovers you know where to go (the do also sell normal shaped brushes, in case for some strange reason you didn't like unicorns or mermaids). The company is still a baby, starting in September 2017 but is already very popular and it isn't hard to see why. I first saw the company on Instagram and fell in love, they are amazing brushes and when I got the chance to get my hands on them I jumped at the chance. 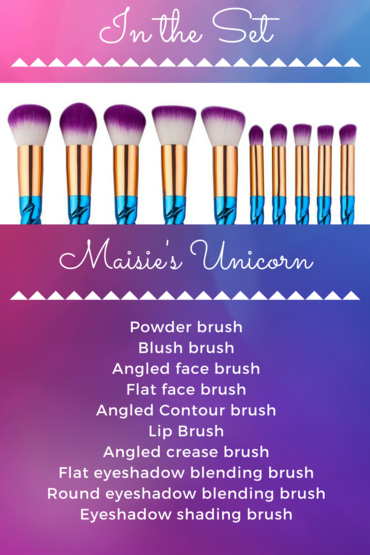 I decided to go for the Maisie's Unicorn, they are pink, purple and blue unicorn horn brushes, the bristles are white with a purple tip. You can see the passion the brand have as soon as the envelope lands on your door step. 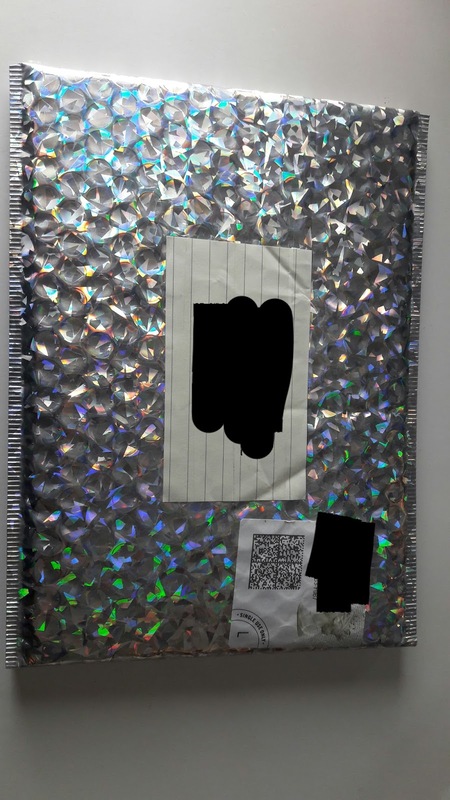 It is a silver mermaid looking type envelope. Its the type of envelope that you know your getting something fun inside. 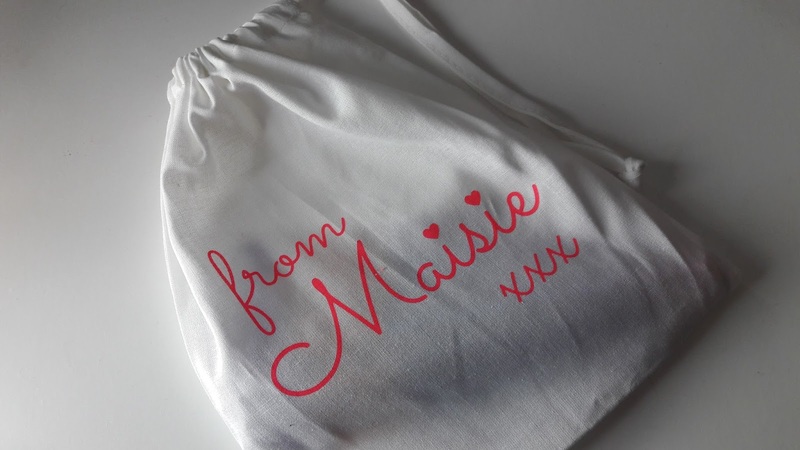 The brushes themselves come in a white drawstring 'From Maisie' bag, and then are wrapped individually in plastic. I like that since it shows each brush is really looked after individually rather then having something that is just dumped all together. In the pack you get 10 brushes, 5 face and 5 eye/lip. The brushes themselves are super soft and you can feel the quality in them, they don't feel cheap. I have had cheap brush and straight away you can tell they will fall apart but the 'From Maisie' brushes really do feel nice and strong. I started to use the brushes the next day and being truthful a week later I am still reaching for them rather than my normal brushes (including my beauty blender). I use the angled face brush as a foundation brush, I don't find my foundation streaky and I have found it is speading up my make up in the morning, (which can easily be spent snoozing that alarm). My favourite brush has to be the shading brush, it feels so nice and simple to blend out my eyeshadows. Having a little bit of a hooded eye, blending is important for my eye shape to match. I have used the brushes on a few palettes and it picks up the product well, I haven't had as much fall out from shadows using these brushes. The unicorn handle makes it easy for me to hold as well. I have a deformed thumb so it is a lot smaller then my other thumb so I do find this a lot easier to hold then other brushes. So far the only brushes I haven't used have been the lip brush and the flat face brush, just because I don't use lip brushes and not being 100% on my make up brushes I don't no what I would use the flat brush to do. The blush brush is ultra soft but I must admit I have used it to powder my face with rather then a blush. This is because of the slight point it has, I find it goes under my eye easier. The care of the brushes is as easy as any other, I clean them in baby shampoo and I store them in my little pot for makeup brushes. I love the added bonus of having the 'From Maisie' bag, I can see that making traveling with them so much more easy. It will also be good to pop in a couple of make up items in the bag as well since it is quite a good size bag. I really like these brushes and I just hope 'From Maisie' expand and maybe add brushes like highlighter, angel brush for eyebrows maybe. Or maybe even a mini unicorn horn beauty blender (a girl can dream can't she). If you've been looking at them and your not sure, honestly do it! I'm glad I did.